Award-winning property at 1948 Courtland Ave.
Kettering is a great place to call home! Attractive and healthy neighborhoods improve property values and maintain a strong demand for housing in Kettering. A well-kept neighborhood says that residents take pride in their community. With pride comes value, beauty and a great image for our City. 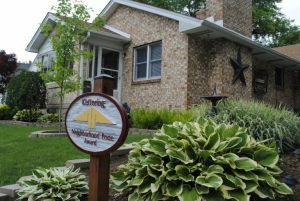 In our last survey, 97 percent of Kettering residents said they are very satisfied with their neighborhoods as a place to live. There are many things to be proud of in our City - our citizens, our schools, our community spirit and of course our neighborhoods. By nominating someone for the Neighborhood Pride Award, you encourage our residents to keep Kettering the place everyone wants to live. The Neighborhood Pride Award recognizes people who have made significant improvements to the appearance of their homes or who have maintained their home impeccably year after year. All Neighborhood Pride Award winners are publicly recognized at a City Council meeting, and an attractive sign is placed in their front yard for three weeks, to let everyone know of their honor. Last summer, over 500 properties were nominated for the award and 38 awards were presented. Please nominate your neighbor, yourself, or any Kettering resident you think is deserving of the award. To nominate a property complete a nomination form by August 1.